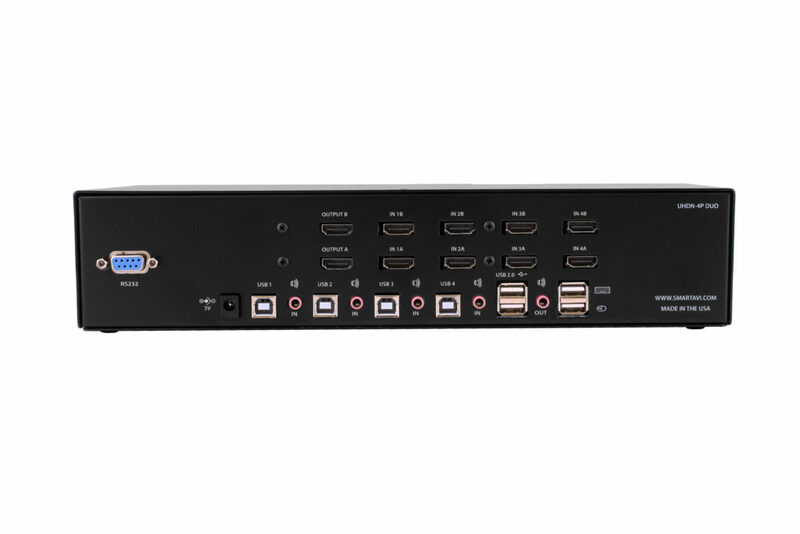 4K ULTRA HD 4-Port, Dual-Head HDMI (4K/60Hz) Ultra-HD KVM switch with USB 2.0 and audio support. 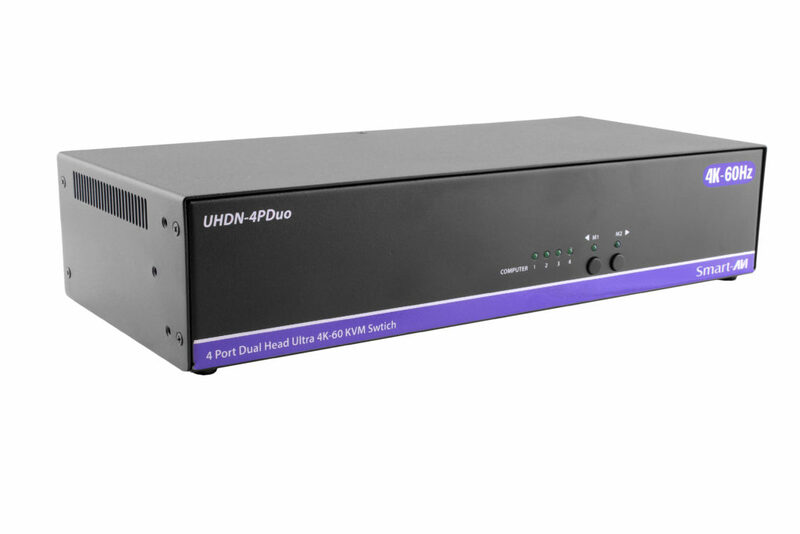 The UHDN-4P-Duo is a 4-port, dual-head HDMI KVM switch with Ultra-HD 4K/60Hz resolution video emulation. It can control keyboard-mouse functions on up to four remote computers, and emulates video from HDMI source devices. The UHDN-4P-Duo is the perfect control solution for supervisors and administrators who use dual-displays with HDMI connectors, allowing them to take command of keyboard and mouse functions on remote systems with the press of a button. 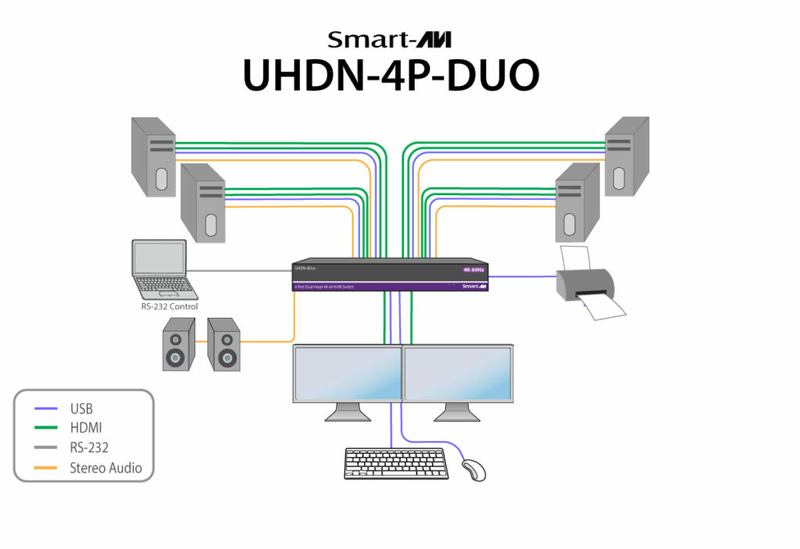 Better still, the UHDN-4P-Duo is the first dual-head KVM switch on the market to offer full Ultra-HD 4K emulation at 60Hz directly out of the box. It features EDID-assisted HDMI emulation, which ensures visual workspaces and screen resolutions are remembered every time it connects to a new system: it's a powerful, simple, and invaluable tool! Front Panel Buttons: switch between devices you wish to control and emulate with simple SELECT buttons on the UHDN-4P-Duo's front panel. USB Keyboard Hot Keys: control switching functions of the UHDN-4P-Duo using programmable Hot Keys on a connected USB keyboard. RS-232 Commands: control switching functions of the UHDN-4P-Duo using RS-232 serial commands. 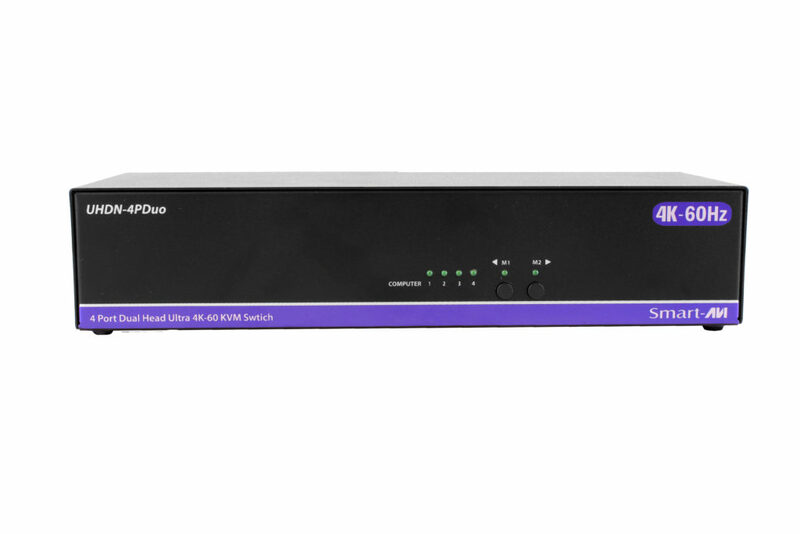 The UHDN-4P-Duo excels in any professional multi-system environment, especially those where high resolution video plays a crucial role in every day workflow. Ultra-HD 4K KVM switching is a great fit in environments like server hubs, control rooms, production studios and post-production houses, transportation facilities like airports, hospitals and medical centers, and corporate IT service centers. Supports up to Ultra-HD 4K (3840x2160) @ 30/50/60Hz. Supports LPCM, Dolby-AC3, DTS7.1, and DSD/Dolby TrueHD/DTS-HD master audio. Supports HDMI 1.3, 1.4, & 2.0. Control up to four computers with a single KVM. Full EDID HDMI video emulation. Zero pixel loss with TMDS signal correction. Supports all USB 2.0 devices. Hot key commands for quick channel selection. Independent (asynchronous) switching of KVM and peripheral USB ports. Users can scan a document and save in another computer. Complete KVM emulation for error free booting. Easy switching via front-panel, RS-232 or hot keys. Full HDMI support, backwards compatibility.